Steve Brown is an accomplished speaker, author, strategist, and executive coach. He is the former Futurist and Chief Evangelist at Intel Corporation, with over 30 years of experience in high tech that spans research, planning, engineering, marketing, manufacturing, and management. Steve helps organizations to understand the major technologies that will shape the future five, ten, or fifteen years from now, and then to determine the strategies they will need to follow to take best advantage of the next phase of digital transformation. Steve inspires his audiences to think beyond the current status quo, and to imagine ways that they can optimize operations, create new value, and delight customers in new ways, all by taking full advantage of emerging new technology platforms. Steve speaks and writes in plain language about the continued advances in computing and how they will intersect business, cultural and human trends to create both new opportunities and new challenges. His new book, Hacking Reality, will be published in 2018. Steve has been featured on BBC, CNN, Bloomberg TV, ABC News, CBS, and in Wired, The Wall Street Journal, and many other media outlets. Steve works with a wide spectrum of organizations spanning transportation, retail, hospitality, government, education, agriculture, healthcare, energy, manufacturing, media and entertainment. He offers a rich menu of services including speaking, consulting, and Futurecasting workshops. These custom, one- or two-day Futurecasting workshops help organizations to project how trends will affect the future of their business and then build strategies to shape that future and thrive within it. You can learn more about Steve at Baldfuturist.com where you can read his latest blog posts and review samples of his work, including his popular TED talk. 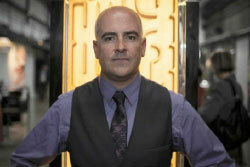 You can also follow Steve on Twitter (@baldfuturist) and Facebook (www.fb.com/baldfuturist). Steve holds Bachelor of Science and Master of Engineering degrees in Micro-Electronic Systems Engineering from Manchester University. He was born in the U.K. and became a U.S. citizen in 2008. He sits on the board of the Brian Grant Foundation, a non-profit devoted to helping people with Parkinson’s Disease to live the best life possible. He lives with his wife in Portland, Oregon. Kobus Van der Merwe is the Jay Lepreau Professor in the School of Computing and Director of the Flux Research Group at the University of Utah. 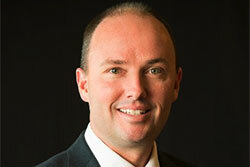 He joined the University of Utah in 2012 after fourteen years at AT&T Labs - Research. He does networking systems research in a broad range of areas including network management, control and operation, mobile networking, network evolution, network security and cloud computing. 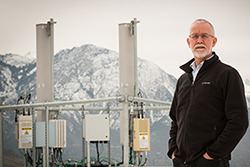 He is the PI and Director of the POWDER project (Platform for Open Wireless Data-driven Experimental Research), one of the newly selected NSF PAWR platforms.